For some reason whenever it's my birthday I feel obligated to have a 'new' outfit to wear for whatever I choose to do, weather it be a meal with my family, or a party with my friends. This year I am turning 21 and I have NO idea what to do to celebrate (ideas welcome.. no clubs) But what I do know, is that I want to look nice.. haha. 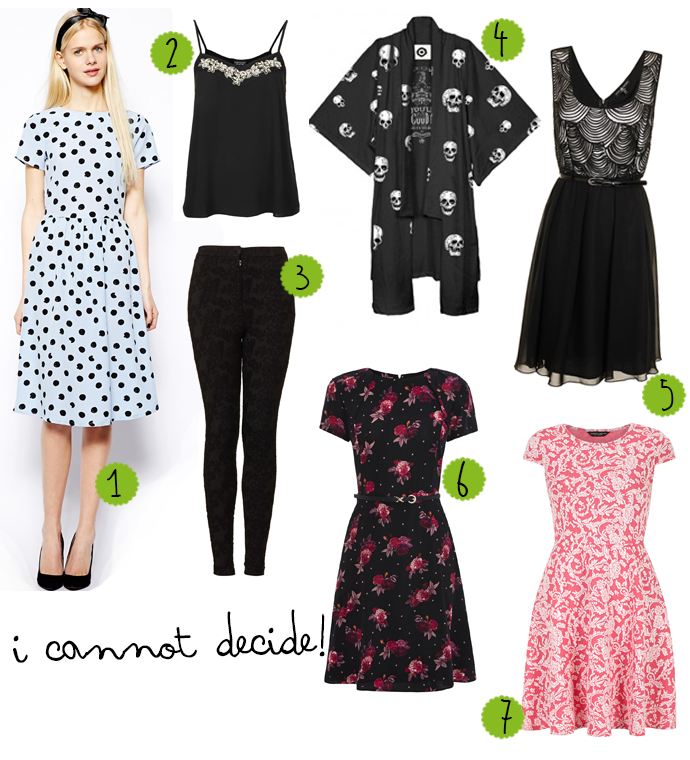 Help me decide what I should wear! I'm most likely going to be doing something with my friends on Saturday and a meal with my family on my birthday (Sunday the 2nd) Two things to keep in mind.. I will be re-dying my bright pink tips soon, and also I want to wear my leather jacket with said outfit, so let me know what you think would look good! ONE = This dress I found on ASOS but is River Island. It's pale blue (not off white) and I love the polka dots, it reminds me of the Topshop make up packaging! I'd probably wear this with my leather jacket, a statement colourful necklace and primark heeled boots, or new heels? TWO + THEE + FOUR = I thought this combo would be nice if I don't want to wear a dress, I have had my eye on the skull kimono for a while now, but I'm not sure how to style it, so I thought a pair of thick flocked 'Treggings' from Topshop and a embellished vest top to keep it simple? FOUR + FIVE = Again, I thought maybe style the kimono with a dress (not sure if they go?) But the dress alone is gorgeous and is from Dorothy Perkins. SIX = This is a lovely dress from Oasis that comes with a belt and I think would look nice with my newly pink hair. SEVEN = This is a lovely stretchy flocked skater dress from Dorothy Perkins (really affordable) and would be great for the food baby I'm sure to acquire.